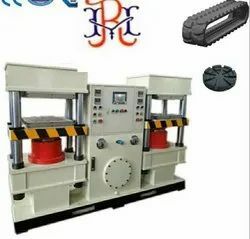 We are a leading Manufacturer of rubber moulding hydraulic presses and sheet molding compound machine for car parts from Delhi, India. Our expertise allows us to manufacture hydraulic presses with up to 20 heating and cooling platens for a total of 19 working cavities. The capacity and size of the platen depends on your requirements and can always be suited. We can provide hydraulic presses with a strong press force capacity up to 40,000 kN and large-sized heating platens. From the automotive to the aeronautics industries, ROYAL HYDROTECH is dedicated to serve major industrial enterprises by providing multi-platen presses for specific purposes, helping them to thrive. That is why we are open to any kind of demand, to create the best custom engineered equipment solution according to your needs. 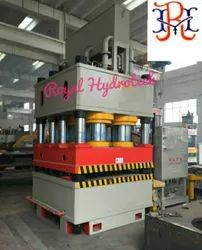 Royal Hydrotech is a historical supplier of large hydraulic press systems for plastic and composite forming applications. One of our core competencies lie in the production of hydraulic press for SMC (Sheet Molding Compound) - BMC (Bulk Molding Compound) / GMT (Glass Mat Thermoplastics). These press systems represent the best option when it comes to high volume production of composite parts with high mechanical properties. We supply SMC, BMC & GMT compression press systems, with capacity from 5,000 up to 40,000 kN, working at very high pressure. All the expertise of ROYAL HYDROTECH relies on the low consumption / high performance feature, realized through active levelling and PLC control. Integration in automated production lines Furthermore, you can benefit from the ROYAL HYDROTECH know-how in complete automated production lines, all our presses can be implemented with automatic loading and unloading robots, cutting systems or other add-on equipment such as HP RTM or vacuum systems, GMT oven or thermal regulation skid. ROYAL HYDROTECH press systems can run both automatically and semi-automatically, whatever your needs. More than 100 units are running worldwide, manufacturing parts for well-known companies of the auto, aeronautics, aerospace and energy industries. Sheet Molding Compound for car parts.